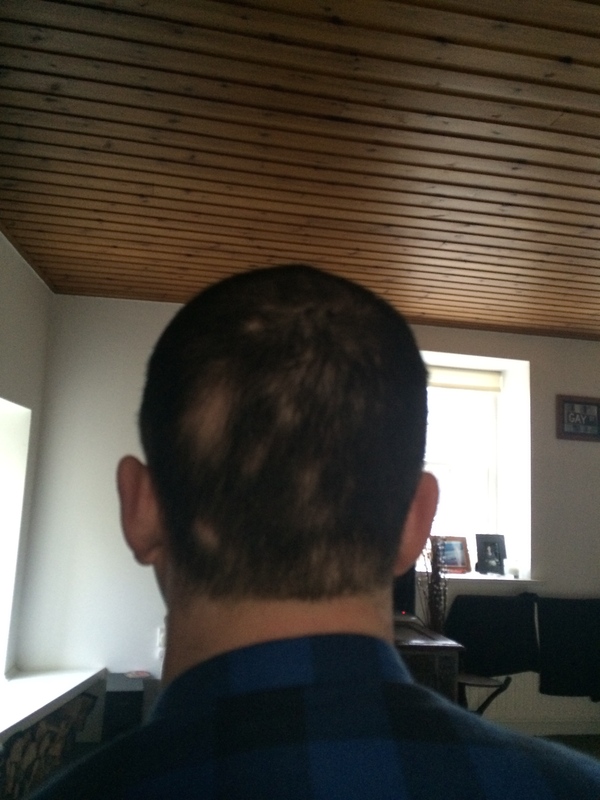 Why I started this blog..
It’s time to take heed of my own advice – as some of you who follow this blog may know – I recently started growing my hair in as it has started to come back all of a sudden. Not yet ‘full circle’ – damn it! A strange thing is happening – some people who got to know me P.A. (Post Alopecia) now imagine me as always having a bald head or a fair complexion. Which is crazy to me as I have always had really dark black hair. When the hair started to come back I thought “Ah this process is like a circle (cue ham fisted analogy…) I am coming back to a full head of hair – full circle – onwards and upwards. 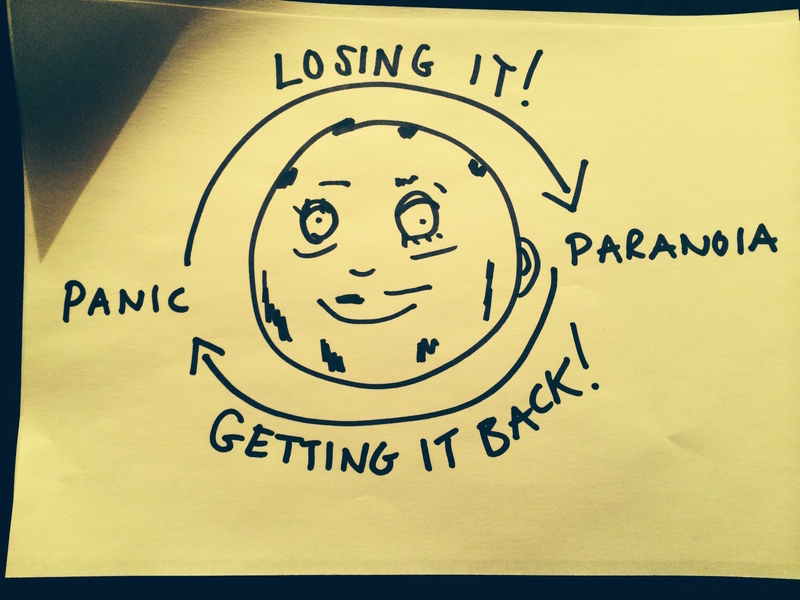 The circle analogy also worked when analysing my actual hair or lack thereof – the ever increasing/decreasing circles. I conveniently forgot that a circle is the same shape on both sides – to get from one to the other you follow the same shape and in my case – to go from no hair – to growing more – I am experiencing the same feelings. This isn’t great news. I now seem to have regressed to a state of embarrassment and acute paranoia as the remaining holes (or circles if I am to flog this damn ‘circle‘ related analogy) seem much more visible thanks to the abundance of reappearing black hair – highlighting the fleshy pink islands of baldy skin. A couple of people haven’t actually recognised me or done the dreaded double take. Which happened ALL the time when I was losing my hair – especially when I had just shaved it off and had zero eyebrows. Some people I see regularly didn’t even know I had alopecia and (I hate to admit this) but I have started to revert to my old stock ritual of blurting out “I HAVE ALOPECIA” added as a tag on to any conversation with a person I suspect is wondering what the f*ck is going on with my hair. How am I dealing with this? I have gone back to my old faithful wardrobe of hats – detailed here and seem to freak out when I have to walk around sans hat! Which is every day at work 09.00 -17.30. I walk to the shops at lunchtime with beanie pulled firmly over my head – not usually an issue with the bleak Scottish weather – though today was sunny, I had a wooly hat on – a sweaty head and decided -TAKE YOUR OWN EFFIN ADVICE!!! As a result, I have been thinking about the advice I have given over this blog and to many people who have emailed me. I have just read through all of my correspondence from you amazing blog watchers and re-read all blog posts, to try and take heed of some of my own advice. Walk tall and let people look – They can look and think what they like, their stares or opinions will not impact the growth of my hair BUT letting potential stares worry me COULD. Stop worrying about the hair – Worrying is not a valuable past time – especially when worrying about an auto-immune condition that may or may not be triggered by stressful situations. Stop running my hands through my ever increasing head fluff (and waiting to see hair come off in my hand) My hair is not falling out like it was so I need to STOP looking for something to be sad/worried about. Stop staring in the mirror – My reflection isn’t going to change in an instant and staring at something for long periods of time leads to obsession and distortion. Try staring at your nose in the mirror for a long time and you will see what I mean! Everyone has their setbacks and I feel I am now in a similar process (looks wise) as I was when I took the decision to shave my head. There are patches of missing hair and I am in two minds whether to shave it all of again or carry on growing it and seeing what happens. Having a shaved head is easier in a way as people just assumed – as above – that I was balding, blonde or they knew I had Alopecia. Growing back the hair and the visual effects I see (or imagine others are seeing) are dredging up the same feelings I had pre head shave but as stated earlier – I am going to keep on trucking and see this through. Last time the circles were expanding – this time they are slowly decreasing – so I figure that in a few weeks, the remaining patches will fill themselves in slowly over time. Whatever happens I will keep you all posted! And accept my apologies for the circle analogy I tried to foist on all of you! Thanks everyone for sharing your similar stories, words of encouragement, your images and best wishes. I am thinking of adding a forum to this blog so other people can share their stories and speak to whoever else they want to. It has been cathartic, extremely helpful and so unbelievably positive chatting to you all so far and I would like the many people who have emailed me to have an easy to use, open network of communication from which they can reach out to other people in a similar situation for advice or support. Let me know what you think and I will get a WordPress plugin for forum functionality. I don’t have much time to write a long message. First, let me thank you for the amazing work you did with this blog. Documenting and sharing your feelings is really great. My case is pretty similar to yours (i’m 28, lost almost all hairs on my body during the last 2 years). 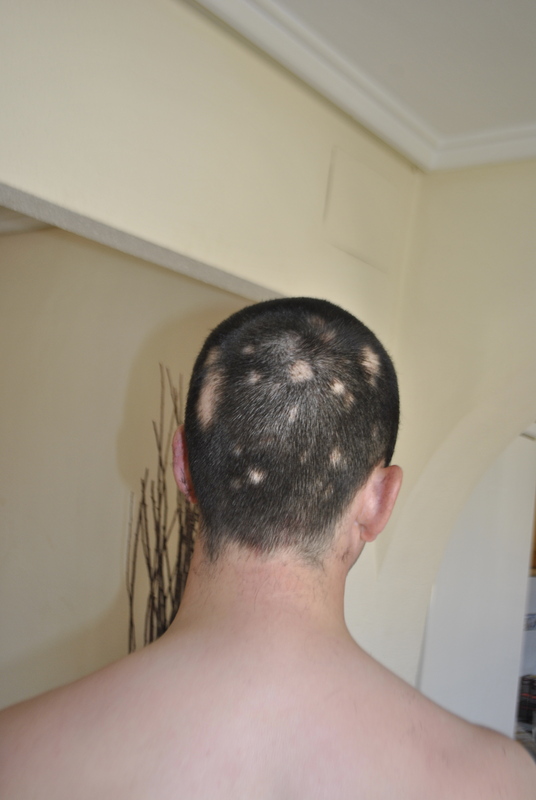 On my side, I had kenalog injections on my scalp and they did work, really. Hairs on my scalp started growing up to almost full in 6 months. Sure, I don’t have the same thickness everywhere, and I get the same feeling you describe in this article. 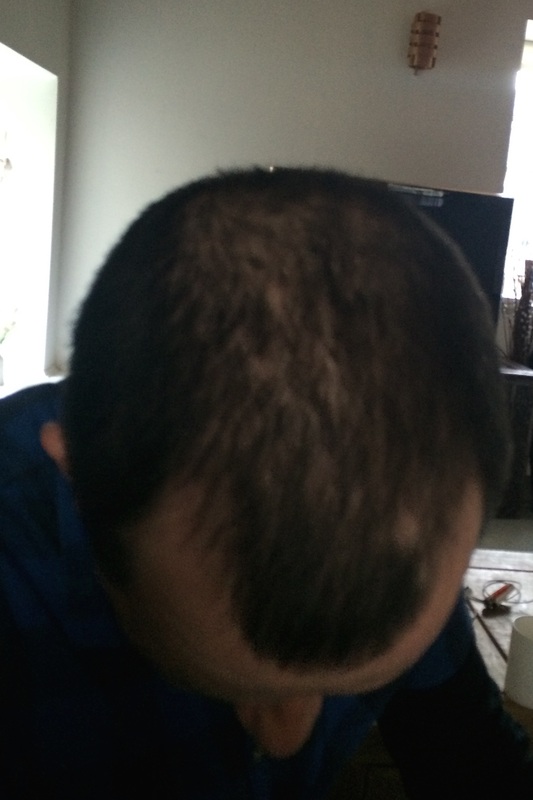 What helped me regain my confidence is using Caboki (http://www.caboki.co.uk/) to cover the area where the thickness is not back to its fullness. Have a look at it. I know you decided to stop buying products and supposedly magical things, but for me it helped, though I still have a paranoia feeling about losing my hair, again. I get anxious when I see 3-4 hairs in the sink after I brushed my hair. Thanks for your comment and all of your info. You are right I am probably not going to try caboki but a lot of people on here might so thanks for sharing the link. Anything that helps gain confidence is great in my eyes! I look forward to chatting with you more, especially when I get the forum plugin! I think the paranoia is extremely normal in cases like this, but when it quickly turns to obsession it has to be dealt with. Am glad you are in a better place and hope you are building great coping mechanisms for the paranoia! Just wanted to see how your doing Reece? Thanks for posting this inspiring story mate. You’re definitely handling alopecia the way I wish I could. Did you change up anything in your diet at all that caused this improvement? Also, I would love to see an updated post of your regrowth if you wouldn’t mind.